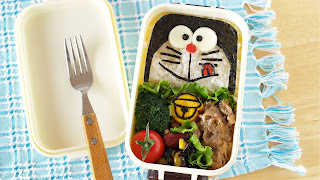 This video will show you how to make a very easy and Kawaii (cute) Doraemon Bento (Lunch Box). You can just attach cut Nori sheet on the rice stuffed in a square bento box. Very easy and cute!!! BTW, I used exactly the same side dishes as Cinnamoroll Bento Lunch Box! ↓ I made this recipe with pork! 4. Cut the egg into 2/3-inch pieces. 5. Cut out Nori sheet to make the shape of Doraemon's bell, and attach. 1. ‪Put steamed rice in a bowl and mix a pinch of salt to taste.‬ Then put the rice in a bento box. 3. Cut out the sliced cheese, Kanikama, and Nori sheet to make Doraemon's face.